While it used to be that monitoring your bandwidth meant solely focusing on internet traffic, bandwidth monitoring now encompasses a broader range of components. For example, you can monitor bandwidth speed or capacity; you can observe network traffic between devices or general web application traffic. Regardless of what traffic you are monitoring, though, it’s important to understand the bandwidth that is being utilized so you can ensure users are getting the best possible performance out of your network. I would go as far as saying that monitoring your network bandwidth usage is the most critical function for any network administrator. What I hope to highlight in this article are the different ways to effectively manage bandwidth to maintain peak network performance with a network bandwidth monitor. To sum it up in one word: data. Bandwidth is quantified as the amount of data transferred in time, typically measured in bits per second. Thirty years ago, data was sent through physical mediums like the postal service; now there are myriad ways to transmit and receive massive amounts of data with the push of a button. Since most organizations rely on the internet to conduct business-critical operations, internet speed can make all the difference in their success. What people don’t know, however, is that there are actually two different types of bandwidth speed: upload and download. Upload speed is the speed at which data is sent to its destination, while download speed refers to the rate at which data is received. It used to be normal for businesses to use low bandwidth services like 56.k modems to transmit information. Now, those who have the funds can install Gigabit speed to their infrastructure to support the growth in data consumption. Firms are still using DSL and cable connections to run their business, but service providers have been able to allocate more resources to support these lower-tier Telco options. Bandwidth capacity is also an important consideration. Bandwidth capacity means the maximum data rate a link can transfer. Bandwidth capacity is an important factor to consider, because when you configure your infrastructure you need to make sure you can support the bandwidth that you require. For example, the service model of your cell phone plan is based on how much data you consume on the vendor’s network. When you’re able to do some monitoring on your bandwidth usage, you’re better able to determine what plan is right for your environment. As another example, consider an environment with hundreds of users. How do you determine what bandwidth to implement? It’s important to have proper metrics and tools that can show you how much bandwidth you’ll require to run your day-to-day operations. For business customers, it can become very difficult to forecast current and future consumption of bandwidth without network insight. What is the Best Way to Do Bandwidth Monitoring? 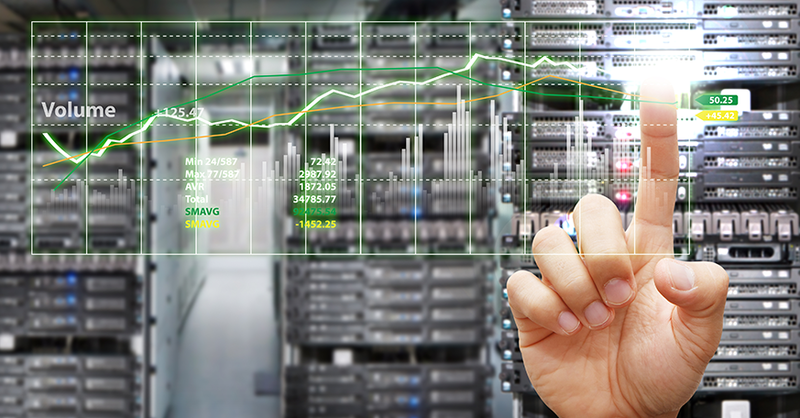 The primary function of network monitoring solutions is to monitor the performance of your network. Certainly this can include different types of bandwidth utilization that can and should be monitored, such as Wide Area Network (WAN) or Local Area Network (LAN) utilization. Using a network bandwidth monitoring tool like Intermapper allows you to monitor in real-time using SNMP polling. It also lets you capture NetFlow data on your network. Intermapper can auto-discover any device on your network, add it to a map, and assign an SNMP traffic probe to the device to monitor the interface utilization. Intermapper allows you to set traffic and device thresholds which highlight network activity and alert you when those values have been exceeded. Intermapper has its own NetFlow Analyzer add-on that can be used to collect more in-depth network traffic data, meaning you can set up flows-supported hardware and software to export network traffic data to Intermapper Flows. Using Flows, you can do traffic analysis at a very detailed level. Intermapper Flows acts as a NetFlow/sFlow collector, where exports are captured, correlated, and analyzed across each respective WAN link. Flows allows for each interface to show current, historical, and peak bandwidth usages patterns. Intermapper Flows can tell you who is sending and receiving the data traveling through your network, and what kind of traffic it is. Is it peer to peer? Is it web-based? Is it traffic on your internal network? When you have a better understanding of your bandwidth utilization, capacity planning and scaling become a lot easier. Using software like Intermapper for network bandwidth monitoring allows you to better plan and optimize your network for peak performance, something that your users will applaud. After all, when you configure your network to support the correct amount of bandwidth, connectivity and speed are improved, and users have a better, more optimal experience on your network. Intermapper can also help avoid performance bottlenecks, connectivity issues, and even usage trends by visually showing which devices are over-utilizing the bandwidth. Most importantly it can show you the actual bandwidth utilization load, which may help with streamlining costs associated with Telco uptick and the hardware used to support it. As an IT professional, Intermapper allows you to become the unsung hero: you can make better, more informed decisions on how to balance and improve network resources, and you can decide what future purchases are necessary to improve the performance of your network. Monitoring your bandwidth is an effective way to keep your networks up and running and your customers satisfied. See for yourself—download Intermapper and try it free for 30 days.